I spoke about Minimum Nutrient Requirements for Putting Green Turf at the Philippine Turfgrass Forum 2013, and UPLB Research, Development, and Extension have graciously recorded a video of this presentation and made it available for viewing. The presentation slides and handout can be downloaded for further reference. This presentation makes use of the MLSN guidelines, which were developed in a joint project of the Asian Turfgrass Center and PACE Turf. The forum involved students, golf course superintendents, golf course architects, professors, landscape contractors, property developers, sod producers, and industry suppliers, with over 100 people in attendance. Dr. Arquiza began the afternoon with a wide-ranging talk on turfgrass in the Philippines and around the world, sharing her experiences and ideas of turfgrass use, as it is, and as it might be. Tomas Valencia spoke about the production, use, planting, and export of manilagrass (Zoysia matrella), sharing his extensive knowledge of this grass and its wide range of uses as a turfgrass in Southeast Asia. We then had an open forum, discussing turfgrass research and teaching in the Philippines, the bermudagrass white leaf pathogen, how one might apply nutrients to fine turf during the rainy season, the relative salt tolerance of manilagrass, and much more. For more information about estimating turfgrass nitrogen requirements from a temperature-based growth potential, the MLSN guidelines for interpreting soil test data, manilagrass as an excellent turf for Southeast Asia, and other articles about turfgrass management in Asia, please visit the ATC turfgrass information page. I am excited to be a part of the upcoming Philippine Turfgrass Forum, organized by Dr. Amihan Arquiza from University of the Philippines Los Baños (UPLB). The Forum will be held at UPLB on 1 August, with Dr. Arquiza and Tomas Valencia as the other keynote speakers. My talk on minimum nutrient requirements of putting green turf will introduce the MLSN guidelines and the temperature-based turfgrass growth potential with an explanation of how this system can be applied to golf course putting greens and to other turfgrass areas. I will explain how to ensure the grass is supplied with enough nutrients to produce the desired surface, while avoiding application of unnecessary nutrients. I will also share five easy ways to improve turfgrass performance, based on extensive study of turfgrass conditions and maintenance practices in Southeast Asia. The Forum is open to the public with advance registration required. Turfgrass Mystery: where can we find this beautiful grass? This might be an easy one. The picture above is manilagrass (Zoysia matrella) and was taken in December 2009. If you've followed this blog, you will know that I am a big fan of manilagrass in East and Southeast Asia, as this native grass produces a fine turf with fewer problems than other grasses in this part of the world. The grass in this picture is perhaps the best example and the best-maintained large sward of manilagrass in Southeast Asia. The simple turfgrass mystery was ... where was this photo taken? This turf is at the Manila American Cemetery. @asianturfgrass @turfgrasszealot @jasonchennault @atlasturf @turfxpert sorry. Manila American Cemetery? The turf here is not only some of the best manilagrass in Southeast Asia, it may be the best large sward of turf in all of Asia. The fine lawns at the Manila America Cemetery are spread over more than 31 hectares and are usually mown at less than 20 mm. The grass here should be studied by whoever works in turfgrass management in Asia. 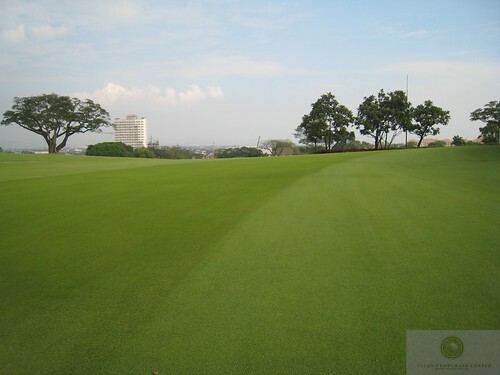 For more than 50 years, the manilagrass has produced an excellent surface here, and the native manilagrass has many advantages over the Cynodon and Paspalum species that are often planted in Southeast Asia. Have a look at this image. It is an aerial view of Wack Wack Golf and Country Club, a 36 hole golf course in Manila. The West Course is on the left side of the image, and the East Course is on the right side. Do you notice a difference in the grasses? To me, the grass on the East Course looks greener and healthier than the grass on the West Course. And the grasses are different. The East Course has broadleaf carpetgrass (Axonopus compressus) fairways and manilagrass (Zoysia matrella) greens; the West Course is all hybrid bermudagrass. Trees on the East Course (see below) throw shade everywhere, but the carpetgrass and manilagrass still thrive in these conditions. The bermudagrass does not. This case study on The R&A's Golf Course Management site provides more details and photos about the benefits of using native grasses at Wack Wack. The aerial view shows just how well those native grasses perform in that environment. Just down the road at Manila Golf Club, there is some incredible shade thrown across the course each morning by a row of 55 story buildings on the east side of the property. In such heavily shaded conditions, manilagrass performs the best, then seashore paspalum, with bermudagrass (Cynodon) not doing well at all. In the photo below, I identify the manilagrass with my nose, and the bermudagrass test plots identify themselves - they are basically dead. In tree shade or in building shade in Southeast Asia, manilagrass performs exceptionally well as a fine turfgrass. But there is another type of shade, one that can block up to 75% of photosynthetically active radiation. That is the shade that comes from clouds. Last week, I took this photo at 10:51 in the morning. The sun was behind a cloud and the quantum meter has a reading of 498 micromoles of photosynthetically active light per square meter per second. That is less than 25% of full sunlight. The effect of clouds is not terribly important for cool-season grasses, and most textbooks ignore it, but this is a big issue for warm-season grasses. I've studied and written about this and its relevance particularly to the conditions so common in East and Southeast Asia. From Indonesia in the south to Japan in the north, we see that manilagrass, and in the areas with average annual temperature above 22°C, carpetgrass as well, perform extremely well. Particularly in shaded conditions, which can be caused by trees, buildings, or clouds, these grasses outperform bermudagrass and seashore paspalum. From August 2011 to May 2012, I collected data on putting green performance from more than 200 greens on nearly 80 golf courses in seven countries. These data are now summarized in this 24 page report, which has also been expertly translated into Japanese by Mr. Yukio Ueno. There are four grasses in the image above (click on it to get a larger view). We are looking at Tifeagle and Novotek (both are Cynodon hybrids), Sea Isle Supreme (Paspalum vaginatum), and a fine-bladed zoysia, probably Zoysia pacifica. This is a test on a shaded green in Manila. The green is maintained for seashore paspalum. The seashore paspalum can handle this shade, although it has a relatively coarse leaf blade compared to the zoysia. Both types of Cynodon fail to produce an acceptable putting surface in this type of shaded condition under which both seashore paspalum and zoysia can produce a good stand of turf. In fact, this zoysia produces a really superb putting surface, as seen at right, a photo I took on the 18th green at Wack Wack Golf and Country Club during last week's Philippine Open. It requires very little in the way of fertilizer, few pesticides, and is able to tolerate the low sunshine levels and tree or building shade that can cause Cynodon, with its higher light requirement, to fail. Wack Wack recently underwent a renovation and the Club made a wise choice to keep the native zoysia on greens and the native carpetgrass everywhere else. There are beautiful mature trees across the property, and other grasses would not produce such fine surfaces in these low light conditions, but the zoysia and Axonopus thrive. Many people ask me "what type of zoysia is that?" My best answer is that it is probably a type of Zoysia pacifica (previously called Zoysia tenuifolia), and I base that on a paper published in 2005 by Akamine et al. in volume 33 of the Journal of the Japanese Society of Turfgrass Science entitled "Morphological Characteristics of Zoysia tenuifolia Willd." In the research project reported in that paper, Akamine et al. found that Z. pacifica leaves are folded in the sheath, as compared to Z. matrella leaves which are rolled in the sheath. Upon close inspection, I found that the fine-bladed zoysia from the greens at Wack Wack has folded leaves, while the leaves of a typical Zoysia matrella from Japan were rolled. For more information about sunshine, shade, turfgrass performance in Asia, and links to a lot more information about assessing the sunshine hours close to your location, here is a video I've recorded with Dr. Larry Stowell from PACE Turf about light. I've participated in many turfgrass seminars and conferences in the Philippines, and last week's Golf Course Maintenance Management Conference was the best so far. With 130 attendees, the conference room at The Orchard Golf and Country Club was filled to hear the presentations from Roberto "Boy" Escaño about drainage, from Siam CC's Sittichai Dusadeeporn about tournament preparation, and from Buddy Resurrecion on rules, maintenance, and marking the course. I also spoke about warm-season grasses and their adaptation to the Philippines climate, utilizing this chart to demonstrate some unique aspects of the climate in Southeast Asia that lead to better performance for Zoysia and Axonopus species compared with bermudagrass or seashore paspalum. The conference was organized by the Philippine Turfgrass Association in cooperation with the Federation of Golf Clubs Philippines and the Asian Golf Industry Federation (AGIF). Delegates included golf course superintendents, managers, and owners, along with others who work in the turfgrass and golf industries. The panel discussion covered a range of topics including how to optimize turfgrass performance in shade, what steps can be taken to publicize and promote golf in the Philippines, and how to encourange more people, and especially young people, to play the game. A cocktail party at the close of the first day's sessions, sponsored by Hunter Industries, gave the conference delegates a chance to discuss many of these turfgrass and golf course management issues in more detail. The second day of the conference saw field sessions on spraying and sprayer calibration, on aerification and organic matter management in the soil, and a practical seminar on marking the course, with special attention given to water hazards, lateral water hazards, and out-of-bounds. After lunch, the conference closed, with many delegates playing a round of golf on the Palmer Course at The Orchard, and others opting for a tour of the course, the golf course maintenance facility, and some of the innovative water harvesting and cleaning programs implemented at The Orchard.